Slovenia – This is where you will experience our most remote canyon, in untouched pristine. Once you’re in the canyon you’re totally committed to completing it. When you’re warm up in upper part, you’ll begin rappelling down the longest waterfall, – 53 meters – whose base leads into the most beautiful part of Fratarica Canyon. Wow! What an amazing day we had have. 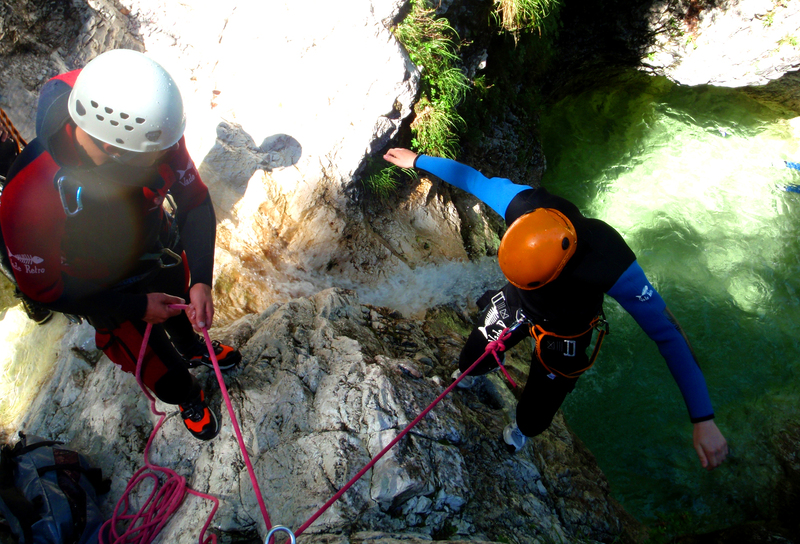 From starting the day not knowing what to expect and we finished the day on a high and loving Canyoning near Bovec. The adrenaline kept us warm for long time. Traveling to the most amazing places in Slovenia. 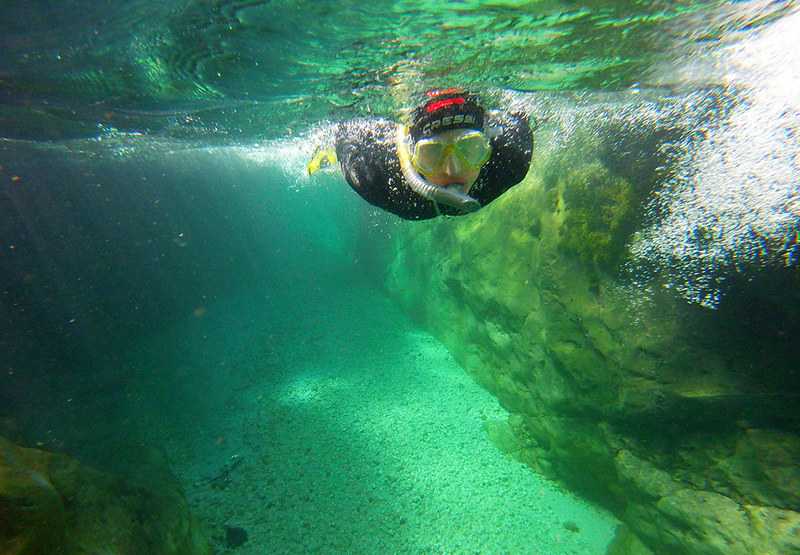 You enjoy these places even more when you do canyoning as you interact with the green scenery, rocks around and emerald wather. For the greatest experience through the canyon a good guide is important. Borut is one of the most experienced guides with int. CIC license. He will make you feel unique, safe and you will enjoy canyoning to the fullest. 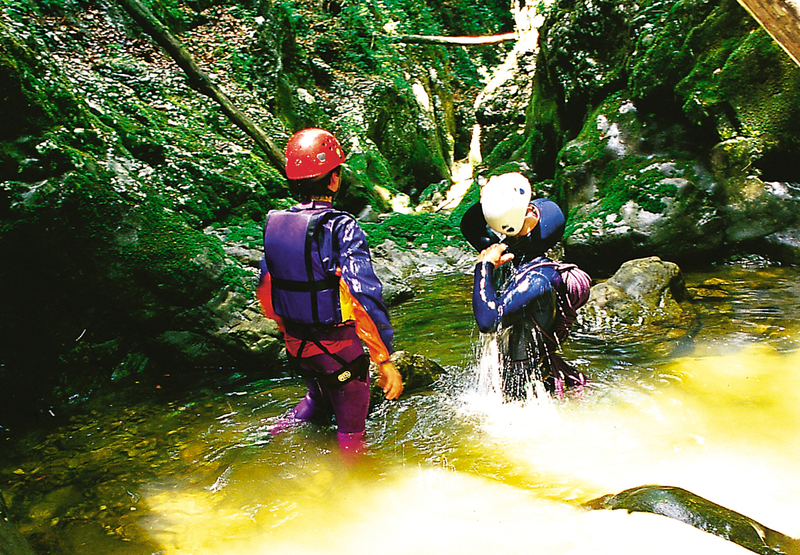 Canyoning in Fratarica is an amusing, energetic and unique way to discover the deft artistry of nature. It is our way of taking you to the most fascinating places in Slovenia. 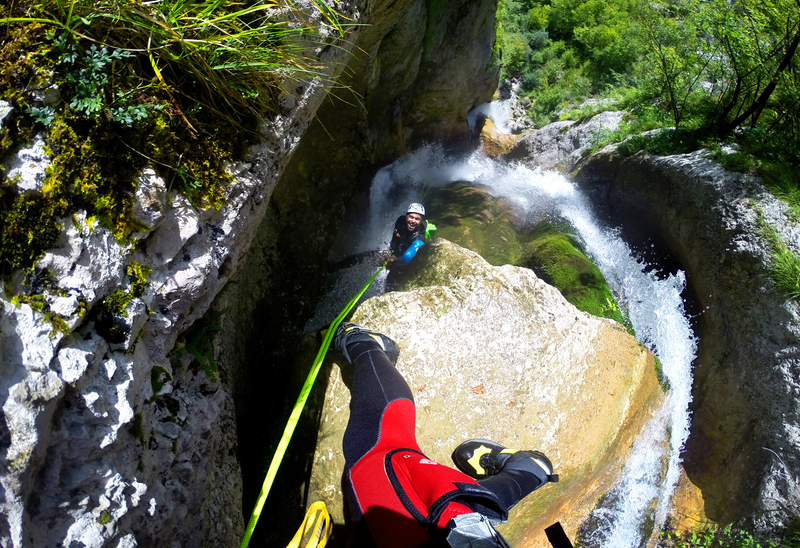 Canyoning is practise throughout the summer season in Slovenia, although the best time is generally from May to July when the water from the Julian Alps is at its heaviest. Our canyoning adventure is a journey unlike any other. You will be challenged to do things that you may have never believed you would ever do, however, this does have a consequence of a positively mind blowing and an unforgettable day out! Fratarica is one of the top canyons in Slovenia. A special habitat under the majestic Loška Wall. A unique 50 meters descent on the Parabola Waterfall. Extremely beautiful one in the Triglav National Park. Globoški potok is an unknown and hidden canyon with beautiful nature. There are two types of people after canyoning: those who are happy, and those who are happy too. Predelica Canyon flows from the Predel Mt Pass in Triglav National Park. It offers jumping into emerald pools, rappelling down high cliffs and sliding through squiggly water slides. It is one of the most beautiful canyons in Slovenia. 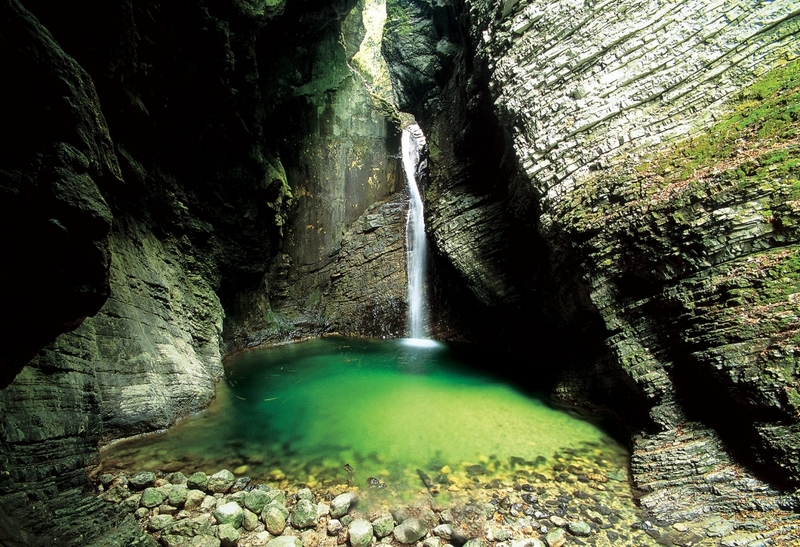 Sušec canyon is a big natural playground where waterfalls and small pools are ideal for deep water jumping. Sušec is the ideal choice for an introduction to canyoning, due to its relative proximity and easy access. Grmečica Canyon is one of the most beautiful canyons located close to Bled. The trip takes you into an area, which is almost unaffected by people and which you can’t see any other way. Slides, rappels and nice nature – the perfect canyon to get to know the basics of canyoning. Jereka takes us to the world, which we did not know before. In this canyon you realize that wild nature still exists. 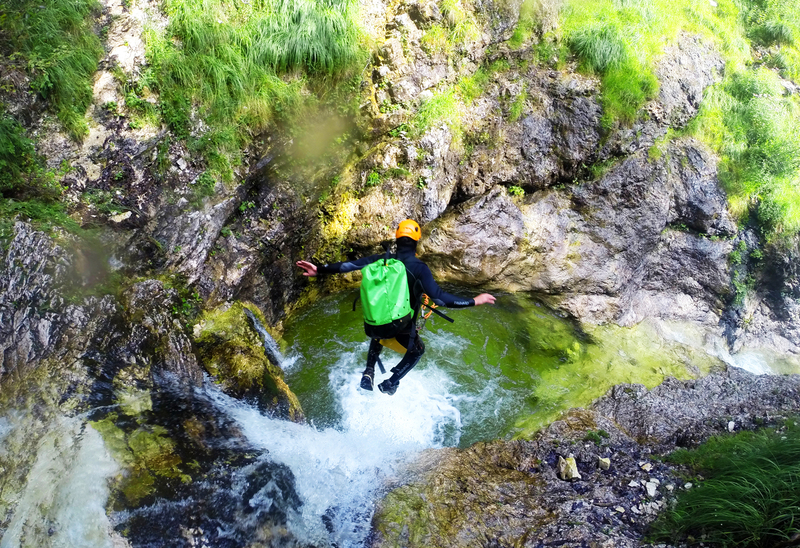 Any beauty related superlative is used describing Kozjak canyoning. Lastly make sure you’re wearing your winning smile on the final 25m Kozjak waterfall as there will be many tourists taking photos of you descending it. River walking and swimming in Učja Canyon is a special form of exploration and a package of pure wet pleasure. River Učja is very appropriate for all lovers of unspoiled nature and for those who wish to “taste” the mysteries of a marvelous canyon. Soca Gorge Snorkeling is getaway place, where You can relax and feel the Power of Nature. The natural world of the river is like a kingdom and deep gorges are the emerald river’s throne. 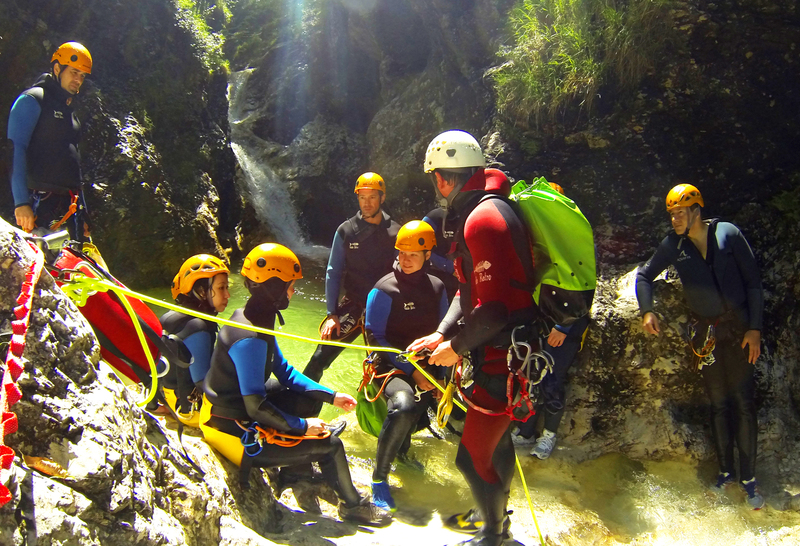 Canyoning groups & Courses Yearly. Happy People with us in Canyons around Slovenia in last 15 years. Friendly, Professional and licensed Canyoning guides. 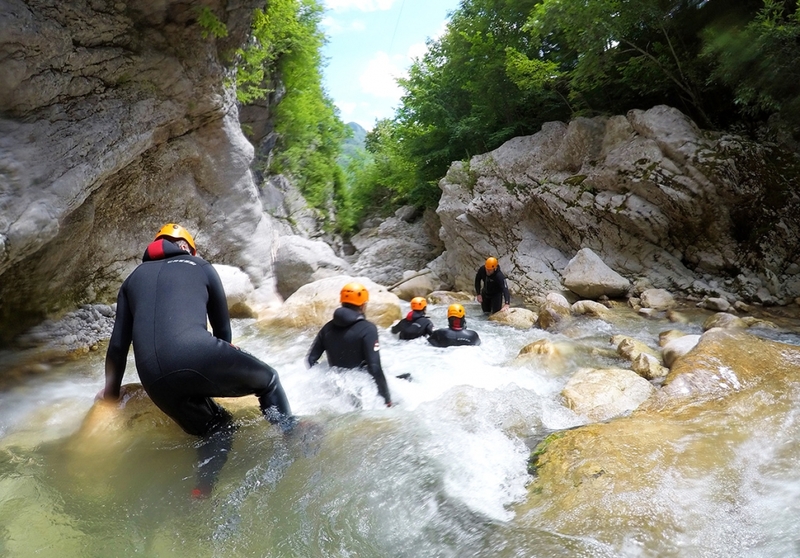 LIFE Canyoning has been operating for more than 15 years offering Slovenian guided canyoning trips through some of the most beautiful landscape Slovenia has to offer. 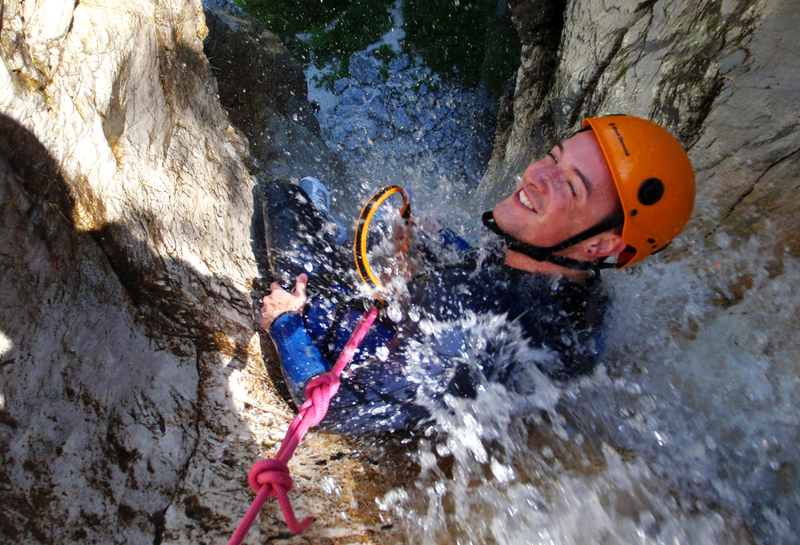 We aim to make it not just the best canyoning trip in Slovenia, but the best ‘true adventure’ experience in the country! With our expertise and enthusiasm for outdoor adventure we will guarantee your experience is positively mind blowing. The following morning we went canyoning, wasnt sure what to expect from this but was one of the most enjoyable experiences on the emerald tour. Again Borut was our guide and his knowledge and experience allowed each individual to push themself or not based on their own confidence and ability. We did the Emerald Isle adventure day with this company. It consisted if a half days rafting on one the most scenic rivers I have been on. The water was crystal clear and was still high and fast for the month if July. Our guide was great funny and full of energy. The second half of the day we went canyoning which we would have paid to do alone. The canyon was brilliant and consisted of so many variations between abseiling waterfalls, jumping and ziplining. Our guide Burut was professional and knew his stuff so we were not waiting ages for him to set up each stage. We were a group of 5 and went canyoning with Borut in the morning and rafting in the afternoon and we had one of the best days of our trip so far. Borut was fantastic, really friendly and chatty and most importantly patient! We went on a three day canyoning adventure involving abseiling down huge waterfalls with Life adventures. None of our party had been canyoning before but thanks to the great guide Borut we did things we didn’t know we were capable of, including an abseil down a 100 metre waterfall! The locations are amazing and will take your breath away. We got transport to and from bled where we were staying and after the first day canyoning we stop off a various points of interest in the Alps. We had a great time and would strongly recommend it. This was our first time canoyning and it was an experience I will never forget. The scenery was breath taking! We canoyning was sooooo much fun! We were climbing up cliffs, jumping off waterfalls and adseilling down huge waterfalls! I will forget the experience. This was my first time doing this so I was quite nervous but our instructor Borut was brilliant. We were in great hands. He made sure we felt safe and enjoyed every second of it which we thoroughly did. Canoyning with life adventures is not an experience to missed! We went on The Great Emerald Adventure, what a great day out. First adventure was Canyoning at Fratarica, when you walk up to the start there’s a restpoint over looking a waterfall ,only 48 metres the guide says!! You will be going down that well you can imagine the look on our faces. Once at the start your adrenaline starts to pump and away you go, sliding into pools at the bottom of two meter pools, the you starts on the waterfalls your securely roped up and relayed down to large pools.The best is yet to come down a fourth eight meter water fall then the flying fox,the rafting afterwards was just as good, highly recommended. Run by a great team. This was our second trip to Lake Bled and the second time we have used LIfe Canyoning. As i remembered from our first experience with them, they were fantastic. We sent them a email for the dates we were there from and the things we wanted to do, they organized everything for us, pick ups, equipment etc. The activities were, two day hike up Mount Triglav, canyoning, rock climbing, and via ferrata. All activities were fantastic and the guides very professional whilst our safety always paramount. I cannot recommend them enough, they offer loads of other activities tailored to meet all peoples abilities and requirements.